The Arctic Perspective Initiative (API) is working towards the construction of free, open, information sharing infrastructures for people living in the Arctic. It is the brainchild of artists Marko Peljhan and Matthew Biederman, and grew out of Peljhan’s 10-year Makrolab project. As the first step, the API is working in collaboration with communities in Arctic Canada to design a mobile work and habitation unit to support seasonally nomadic lifestyles. A prototype is currently being built in Pond Inlet, Nunavut. When complete, the unit will be customisable to suit a variety of needs and uses on the land: from basic survival and safety, to global media streaming, communications, and environmental monitoring. 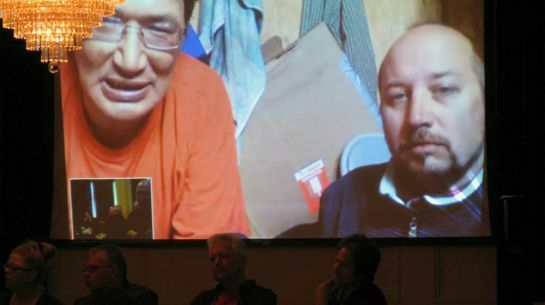 At our event last week at Canada House to launch the Arctic Perspective exhibition, we set up a live satellite internet video link between our panel and audience sitting in Trafalgar Square, London, and Zacharias Kunuk, an Inuit film-maker, and artist Matthew Biederman, in a temporary cabin in the wilderness around Foxe Basin. Zacharias spoke of his excitement at being able to speak live and direct to people in the south about the changes taking place in his environment, whilst still being able to live in the way his traditionally nomadic people do: hunting seals and moving from place to place. During an intelligent and engaged discussion, a member of the audience asked “Where is the art in this?”, to which there are many possible replies, not least an answer given by Marko Peljhan “I am an artist and this is my art”, which was elaborated on by Honor Harger (in the audience), who outlined the artistic heritage of social sculpture, the work of the Helen and Newton Harrison, and so on. I have written before about the role of artists in society beyond their artistic ‘output’, but I also think that – given current intense interest in the Arctic, and initiatives to encourage artists to address ‘climate change’ – we should look at how the specific, local, and the broader geopolitical, contexts of the Arctic are being explored and represented in the work of artists. As an inhabited region, covering several countries, including Russia, Finland, Sweden, Norway, Greenland, Canada and the USA (Alaska), the Arctic is home to many indigenous people and others. It’s difficult even to think of it as a region: the Arctic as an entity is a modern idea and is, in fact, a vast and varied part of the world. In recent years, there has been a plethora of art exhibitions and events featuring work by artists who have been to the Arctic, and it seems to me that much of the artistic output conforms to the accepted iconography of remoteness, beauty, harshness, challenge and fragility, without any sense of an inhabited landscape and the social and historical processes shaping it. ‘Context is half the work’ was one of Artist Placement Group‘s key assertions. Context in the Arctic includes local cultures and histories, ecological, industrial and political pressures, and the challenges of working across nationalities and disciplines. For art projects, context includes relevant histories in art, current art discourse, and the particular schemes and institutions backing artists’ visits. API is an art project, conceived by an artist and presented in arts contexts, which sets out to highlight the cultural, geopolitical and ecological significance of the Arctic and its indigenous cultures. It is also a network of individuals and organisations working collaboratively on a practical project: a utopian quest for an a ‘third culture’ beyond specialisation and national interests. It it art? It seems to me that more interesting questions are rather: Is this something that art can do? And how do we do it well?